Our December 2004 Newsletter is now available online. A PDF version is also available. SAULT STE. MARIE - Local attorney Dyke Justin, 51, in answer to a challenge by the local Rotary Club, swam 30 miles at the Norris Center pool this past weekend in 23 hours, 43 minutes. 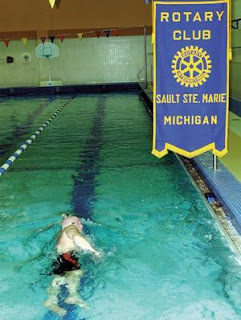 In a fund-raising effort for the Soo Theater project, the local Sault Rotary Club secured pledges to see Justin do his record-breaking swim. Final numbers on the pledges are still coming in, but the Rotary estimates it to be nearly $5,000. Justin entered the pool at noon on Friday, and climbed out at 11:43 a.m. on Saturday - a full 17 minutes short of 24 hours. During the swim, he never touched the bottom or got out of the pool. Rotarians were on hand the whole time as official lap counters, and Justin's family stayed with him for encouragement.